Twenty-four hours after we adopted Nitro from the Salem Animal Shelter I went into total panic mode because I had just adopted a deaf dog. Life as I knew it was about to end. I had recently semi-retired and I was really enjoying my laid back days with our three well behaved dogs. I got up every morning and had my coffee, did the barn chores, went to the gym, went out to lunch, worked with my husband on our websites and just enjoyed life. I freaked out because I knew with a 100% deaf dog it would be a lot of work building his foundation. I wanted to insure Nitro's success at becoming a good canine citizen and for him to be able to communicate effectively with the outside world. After we did a lot of research, purchased many books, and learned how to sign his commands, we decided we needed outside help. 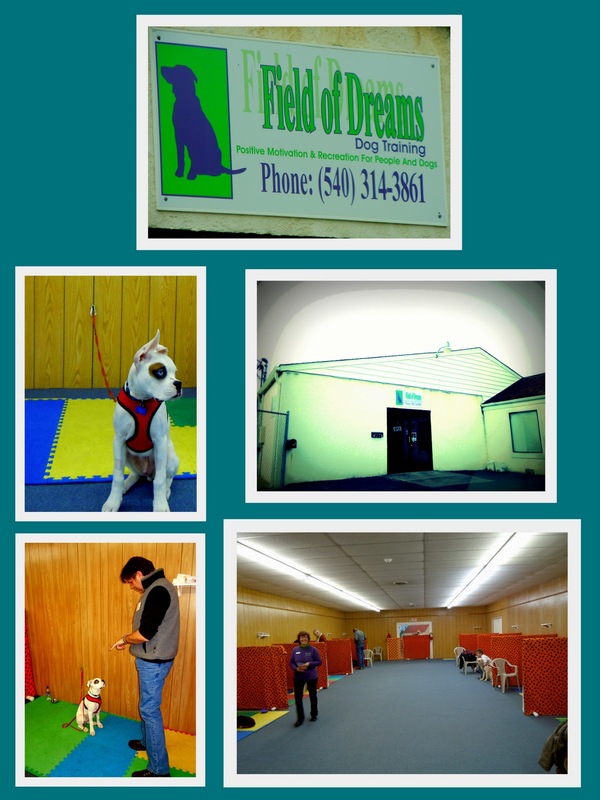 We heard good things about Field of Dreams Pet Dog Training and Agility so we decided to go and meet them at their annual Christmas Open House. 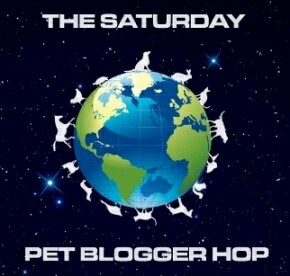 What we found is a group of very professional dog trainers (dog lovers like us) that make learning so much fun. It has been like seeing a big bright light at the end of a dark tunnel and making the decision to go towards the light (hence the special effects on their FOD building photo). It has been the best decision we could have made for Nitro. I highly recommend Field of Dreams to anyone who is thinking about investing the time into building your dog's foundation or at the very least some kind of training schedule with professionals. Training has as much to do with training the owners of the dog as much as it does training the dog. I thought you would enjoy some photos from Nitro's level 4 class. Nitro has gone from a puppy class through level 1, 2, 3, and now he is in level 4 all in six weeks of time. On March 30th he will be starting a 7-week tricks training class but he will also remain in Level 4 training to work on his manners for GCC Certification. As you can see from the photos, the command signs we give him are very effective. We have learned one thing from this entire experience. 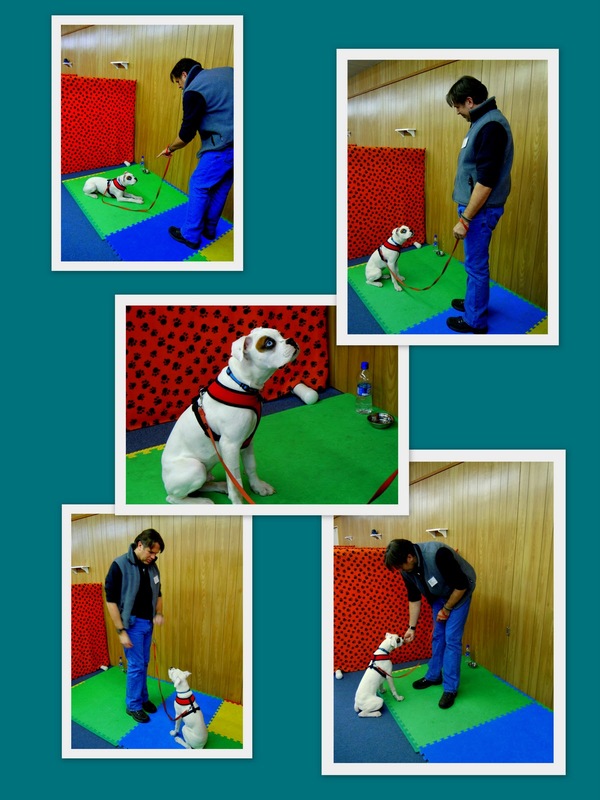 Deaf dogs have a huge advantage in a training environment. Nitro does not get distracted by noise therefore his eyes are always locked on me or my husband. In the long run with such intense focus on his part he learns a lot more in a shorter amount of time. We also take him out in the public everyday so he can be socialized. He is a regular at the Petsmart as well as our local Starbucks. Nitro is adorable. Thanks for touching base about the orientation class on Wednesday. I was planning to attend, and called Karen to find it was pushed back a week. I was actually ok with that because Zoe not having class this weekend meant I got to tag along with Mike on a quick weekend trip to Myrtle Beach. It worked out fine. I'm glad you clued me in on Field of Dreams. I think they'll help Zoe a lot!! Have a nice weekend! Wow, taking care of a deaf dog must be a real challenge for you. I guess you give commands using signs. Good luck to the both of you!